Readers will find something rare: one book that features all of the royal saints together. The author believes this is a book that will appeal to all ages, and is likely to enlighten, inspire, and enhance readers’ faith. Within the pages of Gabriel Kool’s book, Holy Kings, Holy Queens, Holy Royalties ($14.99, paperback, 9781545639511; $25.99, hardcover, 9781545639528; $7.99, e-book, 9781545639535), readers will find something rare: one book that features all of the royal saints together. The author believes this is a book that will appeal to all ages, and is likely to enlighten, inspire, and enhance readers’ faith. “We pray and hope that this book will enlighten, inspire, and motivate all people—especially those in leadership positions,” said Kool. Gabriel Kool was inspired to write this book about holy royalties during his holy hour in the chapel in front of the Blessed Sacrament. Most of his knowledge has been gathered from operating a Catholic/Christian bookstore for 15 years. Xulon Press, a division of Salem Media Group, is the world’s largest Christian self-publisher, with more than 12,000 titles published to date. 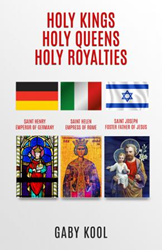 Holy Kings, Holy Queens, Holy Royalties is available online through xulonpress.com/bookstore, amazon.com, and barnesandnoble.com.